Home Blog What Are the Germany Holidays and Festivities? Before you begin working your way to foreign language fluency, it helps to understand the culture behind the language you’re learning. After all, language exists to help a group of people express their ideas and beliefs. Germany is an old country with a rich history and culture. As you begin your German language program, gaining a strong grasp on this history, the values, and the etiquette will help you rapidly achieve success. In particular, Germans have a great tradition of holidays and festivals that celebrate various aspects of their culture while providing them the opportunity to relax and socialize with others. 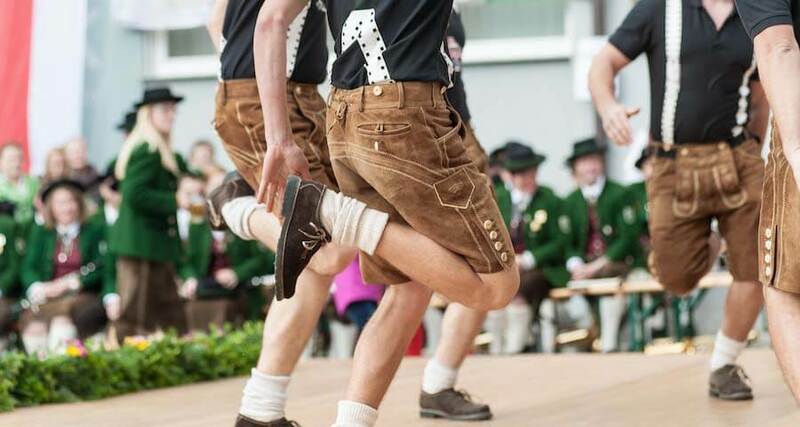 Living in Germany takes some getting used to, but there are many pleasurable aspects of life there; the many celebrations and commemorations of historical and religious events that take place year-round. The Rhine in summer is host to Son et Lumière, which is a series of shows using light and sound, such as fireworks, while regaling tales of historical events such as tales of castles being plundered and destroyed. They celebrate defeat with as much enthusiasm as victory. Another type of celebration is the passion play at Oberammergau. This play commemorates the village of Oberammergau in Bavaria being spared a plague in the year 1634. The people in the village prayed and vowed to perform a Passion as gratitude for being spared. So that’s exactly what they’ve done, every ten years. The Oberammergau Passion Play is a significant cultural event, lasting five days. The characters are all played by the villagers. It is an amazing and moving testimony to Oberammergau’s history, expression of continuity, theater, and celebration. Birthdays are considered a time for celebration. If the celebrant is staying home, they will hold an open house and entertain guests throughout the day. If they are going to work, they will bring cakes and candy to celebrate with their colleagues. If you are visiting someone on their birthday, you may just shake their hand and congratulate them. You can also bring a small gift – but don’t give it to them before their birthday. It is considered unlucky to wish someone a happy birthday right before the actual birthday. There are many traditions associated with German weddings. Friends of the groom might abduct the bride for a short time before the ceremony. Germans wear engagement rings on the third finger of the right hand, and they wear wedding rings on the third finger of the right hand. On the night before the wedding, the family and friends of the couple may throw a party called a “Polterabend.” After the meal, the celebrants will break the porcelain plates to bring luck to the couple. Both bride and groom are expected to clean up the mess and thus demonstrate that they can work well together. There are a number of traditional and religious events celebrated and honored by Germans. State holidays are among them and they are all a very important part of the culture. Epiphany: Epiphany is the annual celebration on January 6, of the three wise men visiting Jesus Christ in the stable of his birth. It also marks the end of the Christmas season. Karneval: In Catholic regions of Germany, Karneval is the last celebration before Lent season, which begins on Ash Wednesday and ends before Easter Sunday, lasting about six weeks. During Lent, Christians fast, pray, and sometimes give up certain comforts. Karneval is normally held the weekend before Ash Wednesday. Easter: Easter is one of the most important events and much of the customary activities such as decorating eggs originated in Germany. The Sorbs, a West Slavic ethnic group, who resides southeast of Berlin, are well known for their exquisitely decorated Easter eggs. The Easter Bunny, “Osterhase” in German, hides the Easter eggs for the children to gather up. Other Religious Festivals: A common theme among all religious celebrations such as Corpus Christi Day, is elaborate decorations, whether it’s traditional costumes or floats, particularly in rural areas. In Catholic regions, there are parades with altars and on St. Martin’s day, youngsters hold paper lanterns during processions. Germans know how to enjoy themselves when it comes to holidays, which play a major role in the country’s social life. Having a long tradition of both Catholicism and Protestantism gives the country several holidays to celebrate that include some major celebrations. Christmas is one important holiday in particular, with popular British and American traditions that include cards, greens, and Christmas trees being of German origin. Each of these holidays has special significance for the German people. Regardless of whether one has a religious background or not, at least some of these holidays are likely to play a role in every person’s life.